Mitchell & Dash Rescued from the Racetrack – They Need our Help! A career on the racetrack took its toll on Mitchell & Dash. 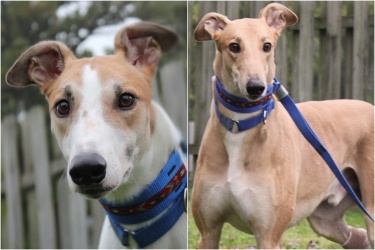 Both of them suffered from badly broken legs and may not have survived if Midwest Greyhound Adoption hadn’t stepped in to rescue them. These beautiful dogs will need 2-3 months of daily care to recover from surgically repaired legs, but eventually they’ll be the happy, loving boys they deserve to be! You can help! Your donation will make a big difference in getting Mitchell and Dash back on their feet – and Zoetis for Shelters is matching funds up to $2,500!